All photos by Lynn Lane. It’s always with a mix of excitement and curiosity that I go to dance concerts by creators whose work I’m unfamiliar with – excitement for the prospect of experiencing new dance wonders, and curiosity for the work and process. I’ve recently found myself asking, what does it mean to do dance work? Where does the art stop and administration begin? What is the primary focus of a life in dance – the physical practice, the audience, the mission? Last weekend on April 6 and 7, Elisa De La Rosa presented Tortillas y Lagrimas at Talento Bilingue de Houston. 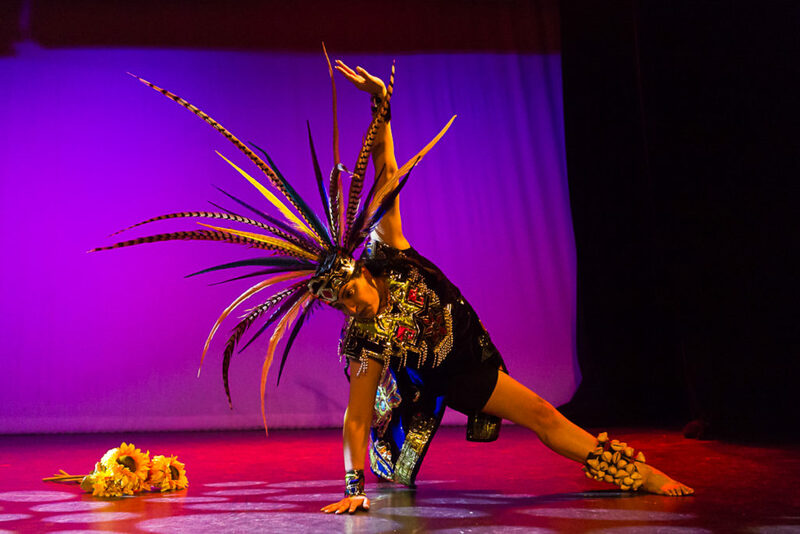 De La Rosa is an MFA candidate in dance at Montclair State University in New Jersey, and Tortillas y Lagrimas was her thesis concert. This type of presentation is the perfect opportunity to witness an artist’s choreographic concerns and share in their thematic interests. The concert proved to be a culmination of De La Rosa’s experimentations with improvisation, Aztec dance aesthetics, and digital imagery. 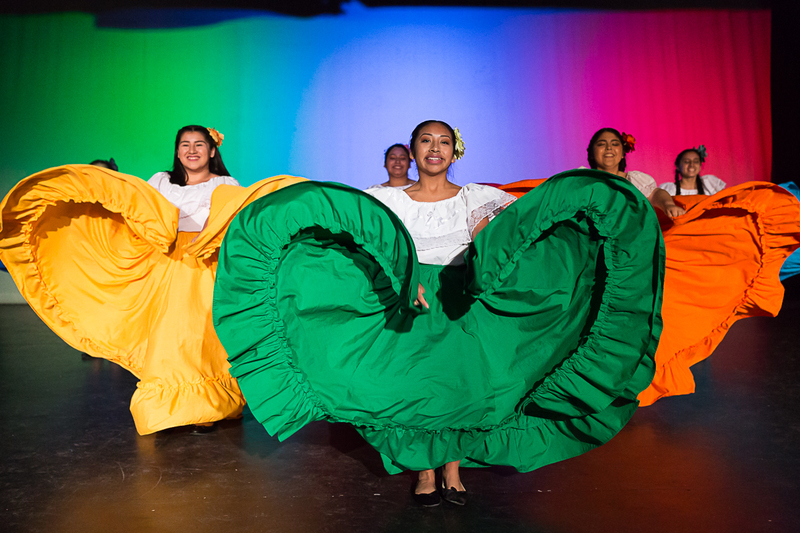 As a public school dance instructor for Aldine ISD, she understands the importance of community in perpetuating art and performance. Many of the pieces on the program were performed by her students, and they did so with lovely spark and energy. De La Rosa’s solo “Xochitalpan (La Tierra de las Flores)” was a stunning highlight. Dressed like Aztec royalty, she wielded a bouquet of sunflowers like a scepter, or even more intriguing, a wand to summon nature’s forces. Xochitalpan is the land of the flowers after all, the mythical afterlife of pre-Columbian religion. De La Rosa is a compelling performer, her movement clear and palpable, her body anchored to the ground, yet, not weighted down by it. The shells on her ankles added a rhythmic quality to her solo, adding to the mesmerizing affect created by her mesmerizing hands and fluid upper body. The solo was successful in evoking the mythology of the Aztecs, a people who were in tune with the natural forces around them. Her second solo, “inmigrante,” was equally evocative, but in a much different way. Based in realism rather than the fantastical, the piece examines her grandmother’s illegal entry into the United States via the Rio Grande Valley River, a journey thousands of Mexican immigrants took during the first half of the twentieth century. The film by Kassandra Sanchez-Alvarado captures a merciless terrain, and as De La Rosa dances in front of it, wielding plastic water jugs around her head, it is clear that this is a perilous, if not deadly journey, one that continues to end in frustrating disappointment for so many. Two other gems on the program were solos performed by guest artists. 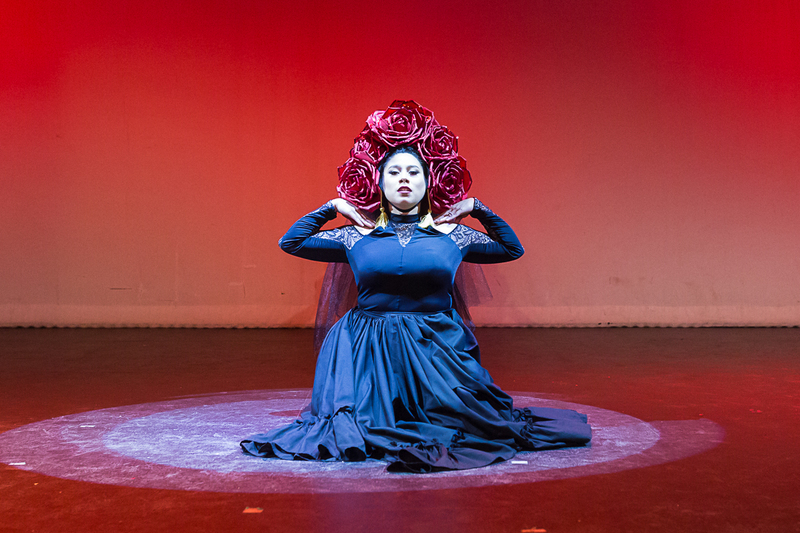 In “Paloma Negra,” the agile and lithe Vanessa Martinez dances through the classic ranchera song about a woman who is done waiting and longing for a man who doesn’t return her love. Martinez becomes the black dove, at first broken and unable to take flight, but by the end of the song she’s at least able to stand on her two feet and realize that the lover who is alluding her is better left forgotten. Her leaps were elegant and her turns expressive, much like a bird maneuvering stormy weather. In “Un Viejo Amor,” Crystal Reyes-Reyna is a woman reminiscing about an old love, one that has left her heart, but not her memory. Reyes-Reyna danced in all black and a large red headdress that glittered under the stage lights. Her dancing was wonderfully decadent, full of emotion and understanding for her character. She moved in and out of the floor with ease and was not afraid to use the expanse of the stage. De La Rosa’s students danced all of the large, colorful group sequences. 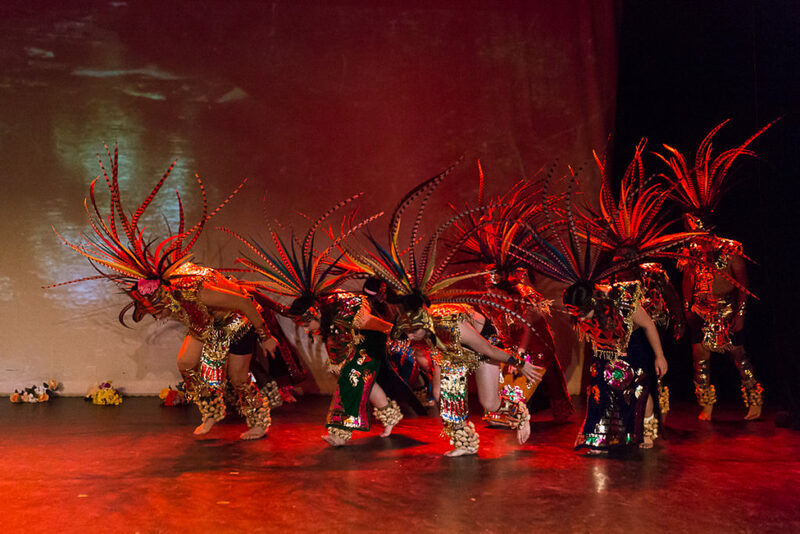 The most notable was the title dance, “Tortillas y Lagrimas,” translated “Tortillas and Tears.” Her dance students are enthusiastic performers, but I was held captive by De La Rosa’s complex and intricately staged choreographic ideas. 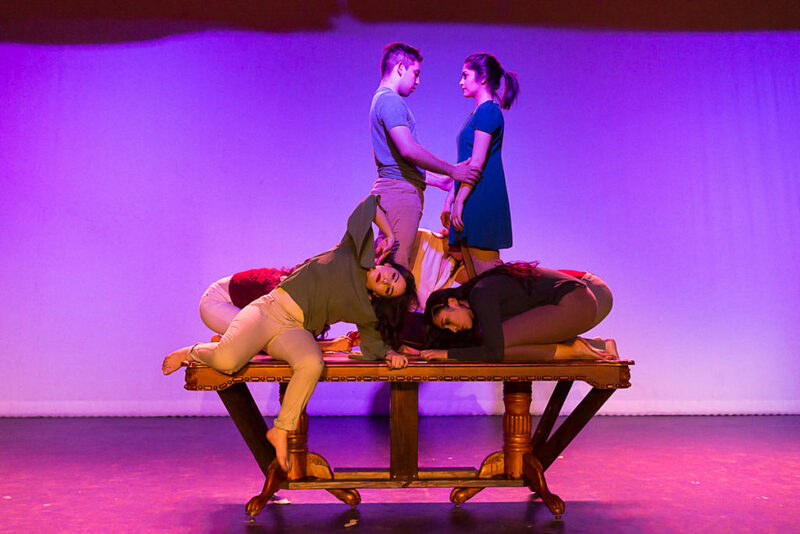 The piece used a dinner table as a thematic focal point, her dancers creating a family scene at dinner. For Mexican American families, the dinner table is what keeps the family together. Food is often the matriarch’s primary tool of communication and, ultimately, power. And tortillas are often the backbone of these families’ sustenance. There are also sequences when the dancers are removed from the table, and connect their bodies with ropes. There is real struggle in these moments, ideas of journey and time and inner conflict conveyed. And then it all goes back to the table – where stories are exchanged, secrets are revealed, and dreams begin. Before the first half ended, there was an audience participation segment which invited anyone interested to go onstage and dance the huapango, a folk dance that’s often performed at large Tejano parties. The visual image of all those bodies on stage joined by a simple step was incredibly beautiful. I think it’s what I will remember most about this concert – the image of De La Rosa’s community in tandem, a community she’s created through her own dance life. Wow 😮 very nicely put! The event was wonderful and had my granddaughters amazed! The performers and the performance was beautiful! So glad I attended the event!